Education Ecosystem, a decentralized learning platform, has announced that they have changed the name of their platform from LiveEdu to Education Ecosystem and released the alpha version of their new product. The new web app has a cleaner design, improved functionality, and new content focused on the company's mission of building the world's biggest project-based learning library on emerging technologies. The name change better reflects the current and future direction of the company. The name of the company’s token, Education (LEDU), will remain the same. The new Education Ecosystem platform includes unlimited projects, live Q&A, certifications and much more. Education Ecosystem has also introduced a perpetual revenue sharing model for project creators, in which they will be paid in both cash and LEDU tokens indefinitely. LEDU tokens are Education Ecosystem’s native cryptocurrency. It is an ERC20 token residing on the Ethereum blockchain. LEDU is used as payment for all financial transactions in the internal ecosystem, as well as rewards for project creators, subscribers, site moderators, and API ecosystem developers. LEDU tokens are also used for governance, giving users the power to vote on the future of the platform, including the features that the development team implements and what new project topics to support. Adding to the list of new product features, are the B2B and B2E services. Education Ecosystem will provide tech training for companies whose employees need training on new products. Through in-depth, custom video tutorials, businesses can train their employees quickly and more efficiently. All videos come with downloadable resources so that the employees can practice while learning. Certifications are also available. Product evangelism is another B2B service offered. Education Ecosystem will not only promote your technical products to your target audience, it will teach them how to use your products with custom, tutorial video projects. Education Ecosystem is also working with schools by creating customized project tutorials for their tech based curriculums. Projects consist of approximately six, interactive videos and students can learn how to build real products with their classmates. This format is engaging, productive and prepares students for the jobs of the future. 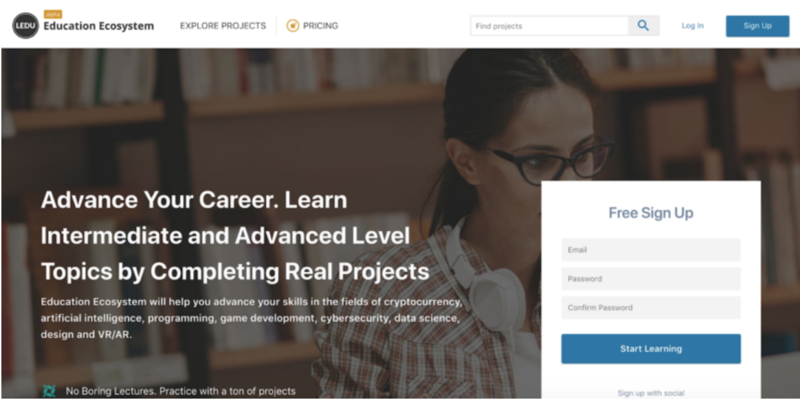 Check out the new web app at www.education-ecosystem.com to enjoy unlimited project video tutorials that will help advance your career. Education Ecosystem is a decentralized learning ecosystem that teaches people how to build complete products in future technology fields. We are building the Netflix for professional development. You can also describe our ecosystem as the next generation Lynda.com. Unlike existing online education platforms, Education Ecosystem is not focused on beginners, but mainly intermediates to experts. Viewers learn on our platform by watching projects their peers build real products.